It’s much tighter and fresher, as Gouez himself says, it very much majors on a bright, grapefruit-lifted, zestiness, more linear than either the 2006 or 2004 that preceded it. But with time in the glass a distinctive, almost exotic cinnamon spiciness appears. What is immediately appealing is the tang of refreshing acidity. However, this is a wine that really needs more time in bottle to reach anything like its true potential and at this stage seems quite reminiscent of, but initially more appealing than, the shy 1988 vintage, which with the passage of time proved to be one of the greats of second half on the 20th century. 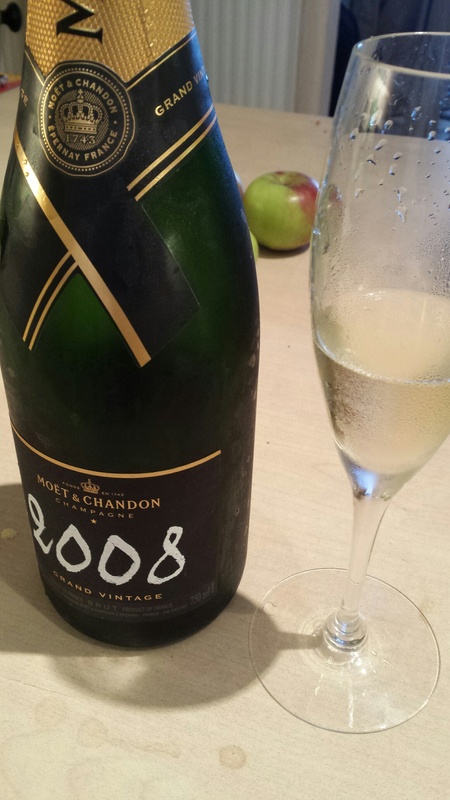 The blend of the 2008, the 72nd vintage released by Moët, is 40% Chardonnay, 37% Pinot Noir and 23% Meunier, and in line with every single release since the 2002, the dosage is a low 5gm/l, so it could labelled ‘Extra Brut’. Each bottle of Moët Grand Vintage now has a disgorgement date on the back label (as well as the detailed blend and dosage level). The wines get a minimum of six-months post disgorgement rest and often quite a bit more, this sample from the first batch released was disgorged in November 2015. In line with the new Gouez ‘freestyle’ approach to vintage champagne, he wants to highlight the individual characteristics of any given vintage, not conform to a regimented ‘house style’ with a set assemblage. With access to 200 out of Champagne’s 323 different crus (including all 17 Grands Crus and 31 of the 44 Premiers Crus) he is in a unique position to do this. The Grand Vintage Rosé 2008, released at the same time as the Blanc, has 46% of Pinot Noir in the blend, of which 20% is vinified as red wine, with the balance of the assemblage coming from 32% Chardonnay and 22% Meunier. With this much red wine it is quite a deep pink and at release, for me, doesn’t have quite the elegance of the 2006 rosé which proceeded it and was one of the best Moët vintage rosés I can remember. It may just need more time to develop. Available from Majestic at £49.99, Mix Six price currently £31.99 a bottle; Tesco down £5 to £35 a single bottle until 3 January 2017.